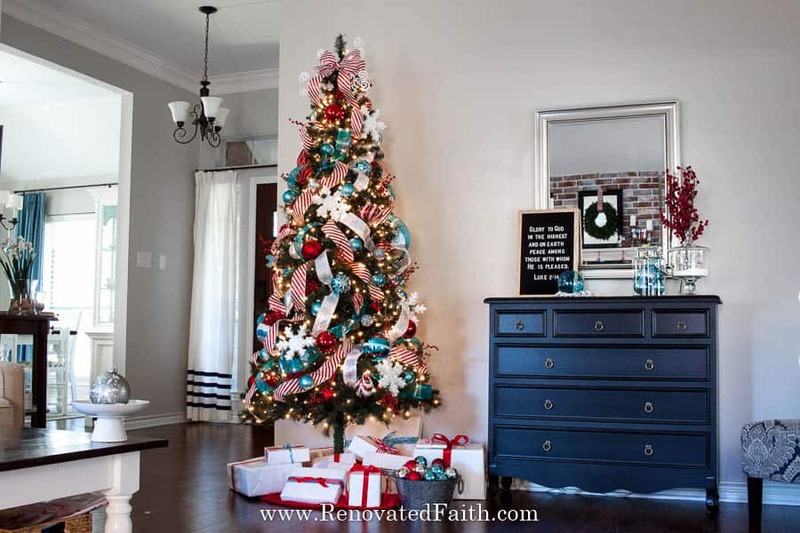 Red and aqua Christmas decorations have always been my favorite as they incorporate easily with the blue décor already in my home. 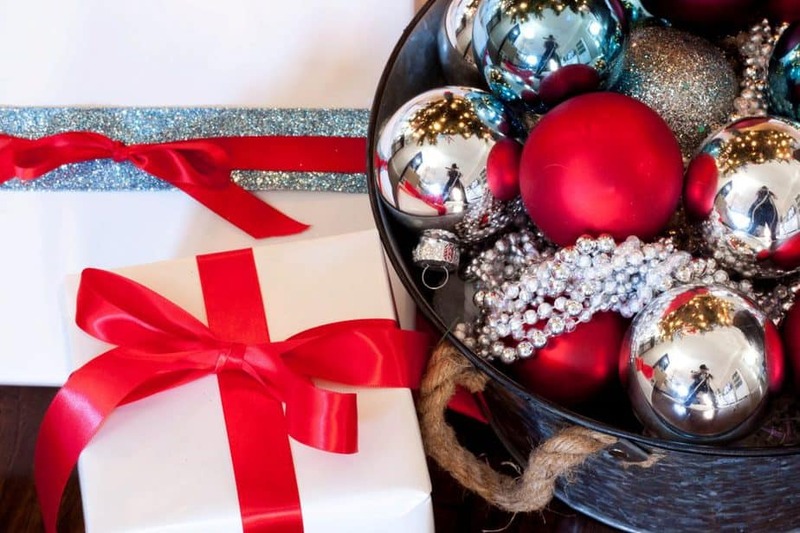 See how I fill our home with Silver, red and turquoise ornaments to give our décor a whimsical, yet classy feel. Disclaimer: Because I’m not truly sure of the difference between different shades of aqua, teal, turquoise and even tiffany blue, I’ll be using them interchangeably in this post. I adore lots of color in my décor as it makes life interesting. 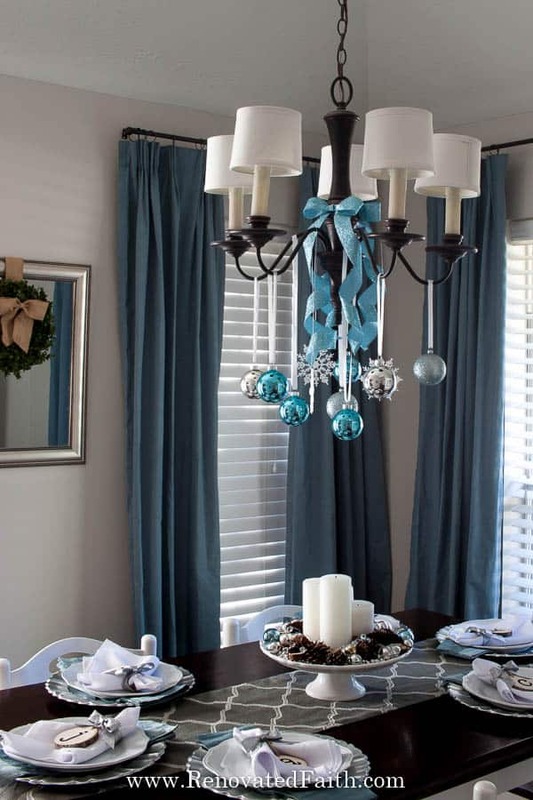 While farmhouse Christmas décor and buffalo check are great, I’ll take aqua and red Christmas décor all day long. 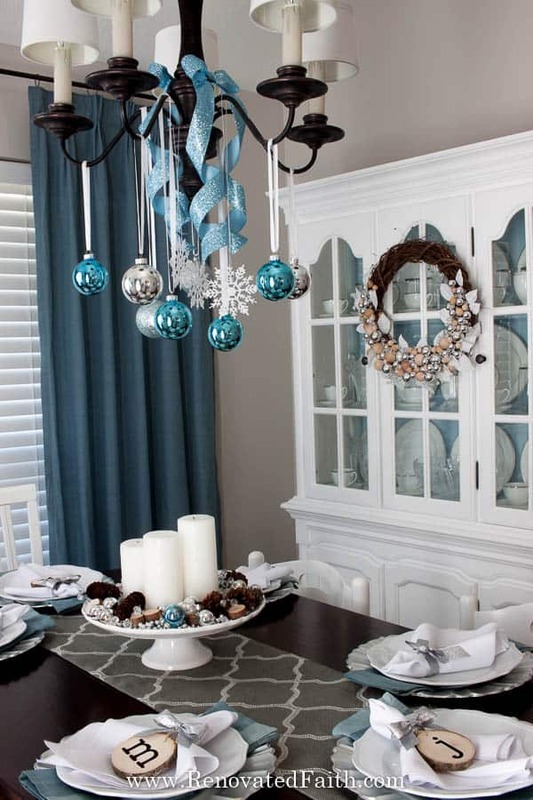 This year I added large snowflakes and I like the way they look with my aqua blue Christmas ornaments. I love that the tree looks classy but is still fun and whimsical for my eight year-old daughter. 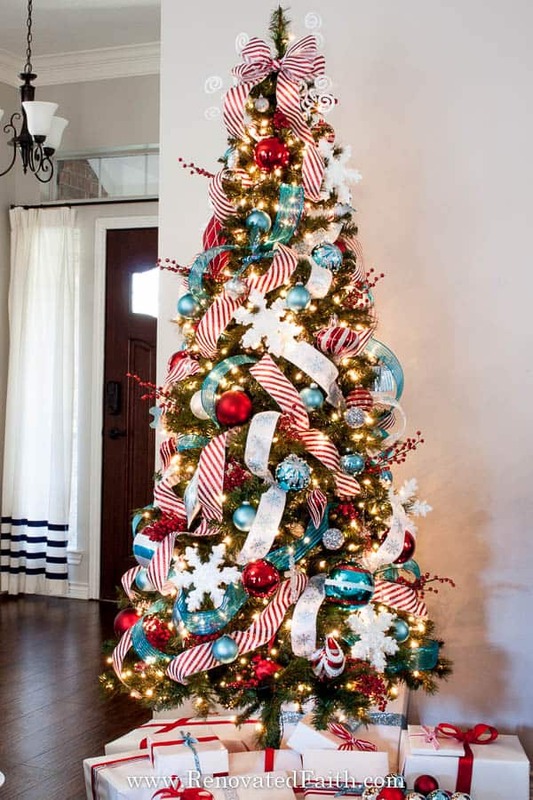 In my new post How to Add Ribbon to your Christmas Tree, I show you step by step how I added the red and aqua ribbon so it looks like it’s weaving in and out of the tree. You will be amazed at my one trick that makes it SO stinkin’ easy! A few of you have asked me if I prefer glass or plastic ornaments. I prefer plastic honestly because of course they aren’t breakable but most of the time you can’t tell the difference. 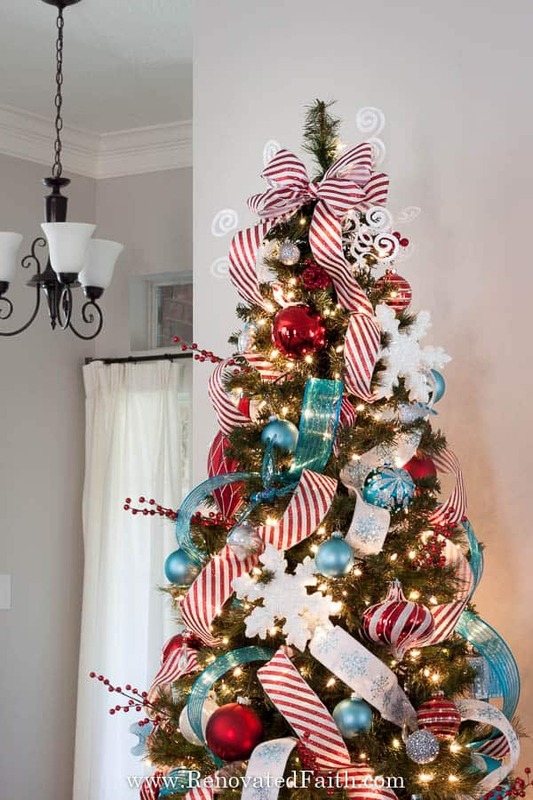 This time I used plastic red and silver ornaments but used turquoise glass ornaments because that’s all Hobby Lobby had. 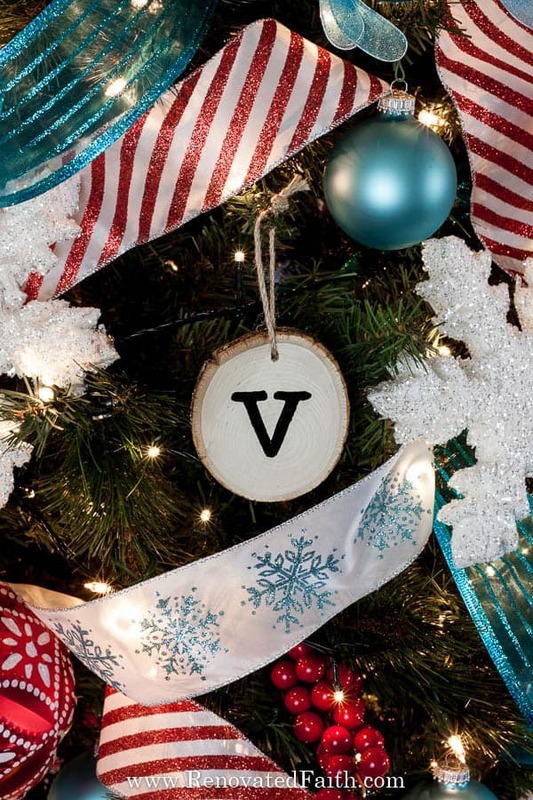 CLICK HERE for my post on how to make Personalized Wood Slice Ornaments. 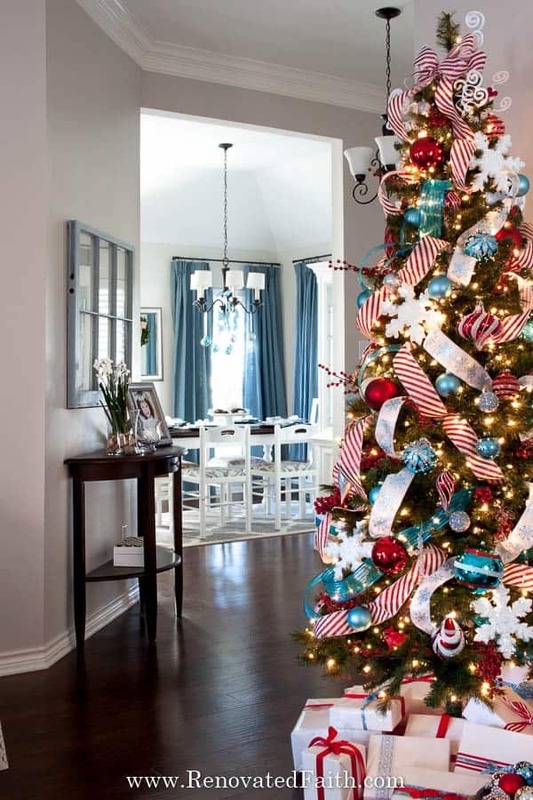 See my NEW POST, How to Decorate a Christmas Tree by clicking HERE. I recently whitewashed my mantel to give it the look of a mortar wash or german shmear but with paint. You can see how I painted it here. 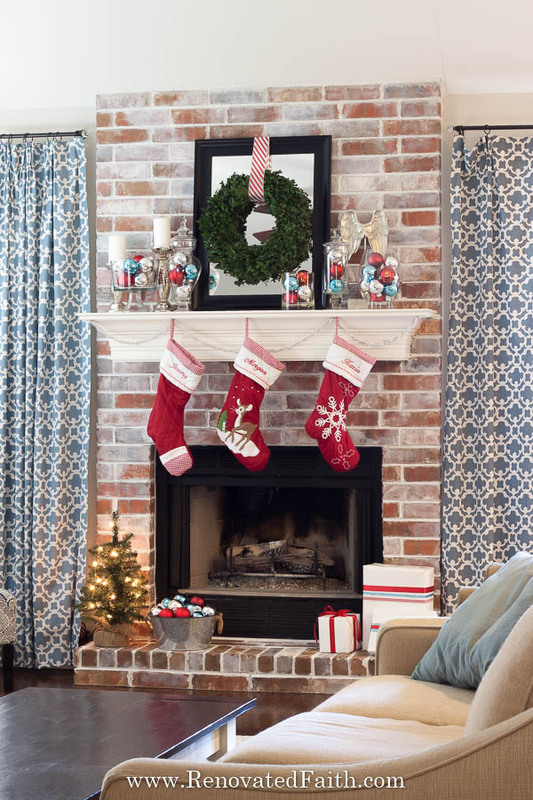 Now I love decorating what was once a drab eyesore. 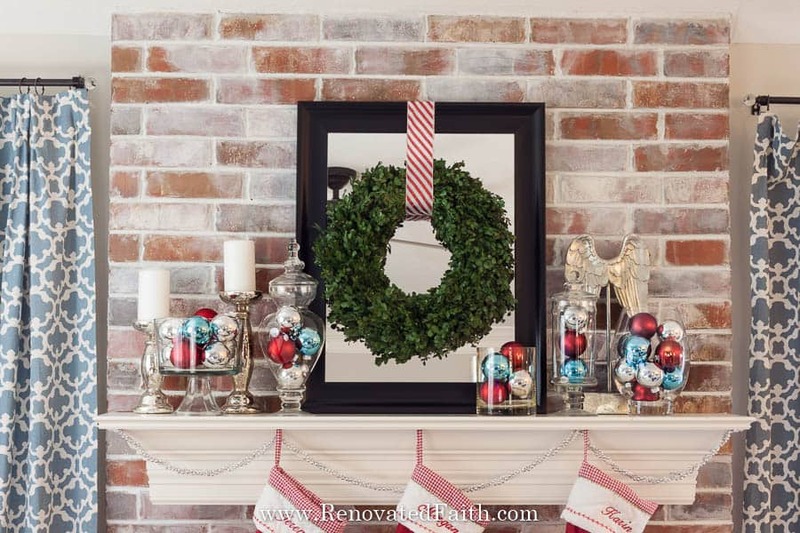 I hung my boxwood wreath from a mirror with the same red and white striped ribbon I used on the tree. (You can make your own boxwood wreath like I did here but I highly suggest you buy one like this – check the current price here). 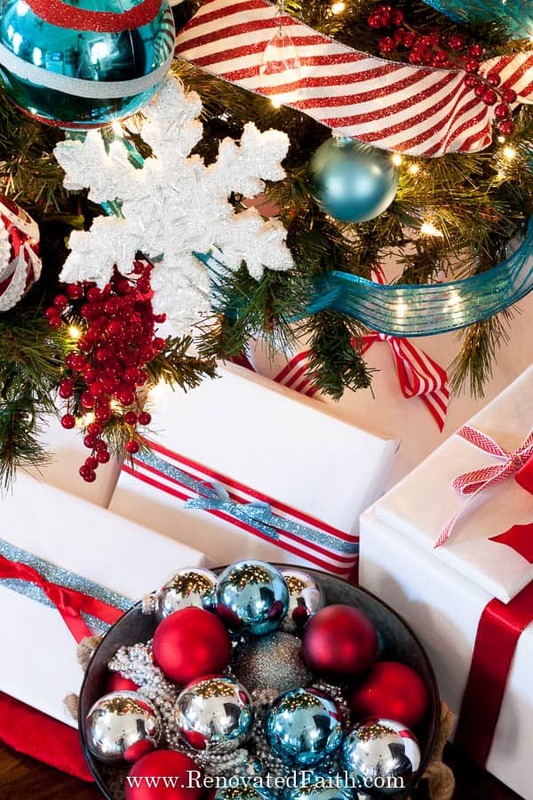 This year I wanted my gifts to coordinate with the tree’s red and teal Christmas décor. 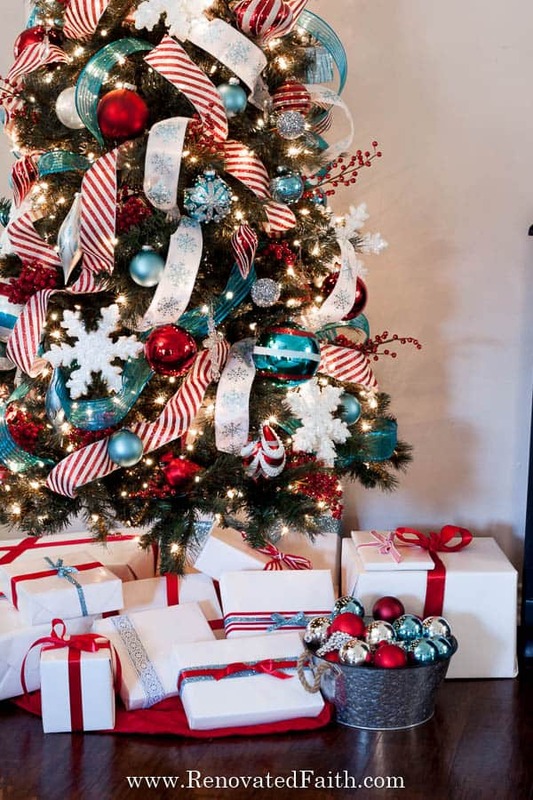 I saw on Pinterest how someone wrapped their gifts in all white and then used fancy ribbon for a touch of color to coordinate with my red and aqua Christmas decor. I was pleasantly surprised with how much I liked wrapping my gifts this way. 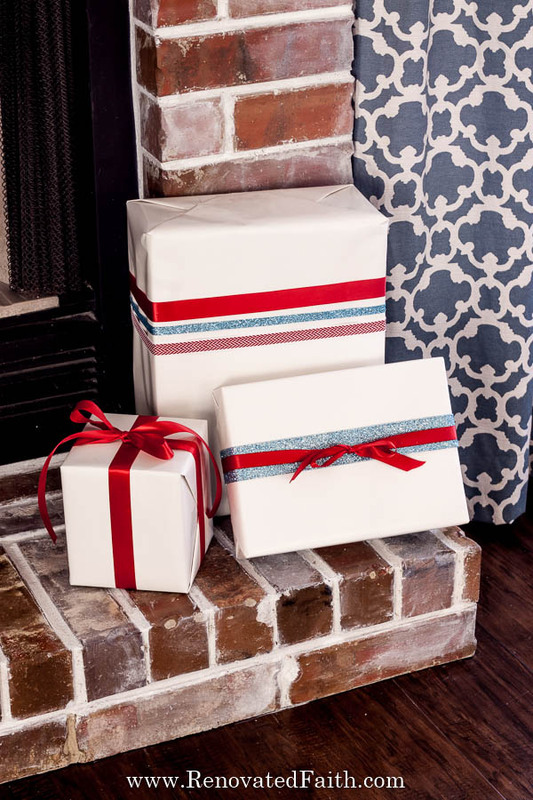 Yes, it’s super cute but I also loved that I got out one big roll of white paper to wrap my gifts. I didn’t have twenty rolls of half cut wrapping paper and it just make gift wrapping so much simpler. Also, I don’t think it took away from the beauty of gifts but the simplicity added to it! 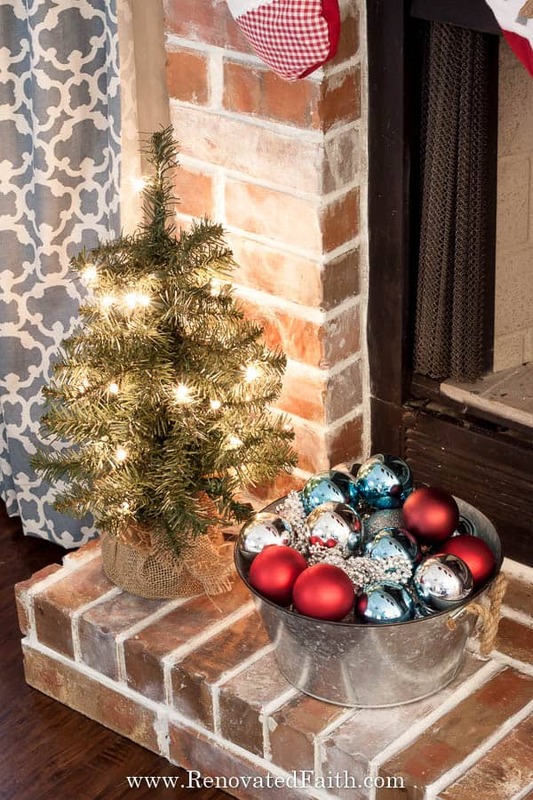 I like my galvanized bucket of red, silver and Aqua blue Christmas ornaments as it adds another touch of bling to the base of the tree. 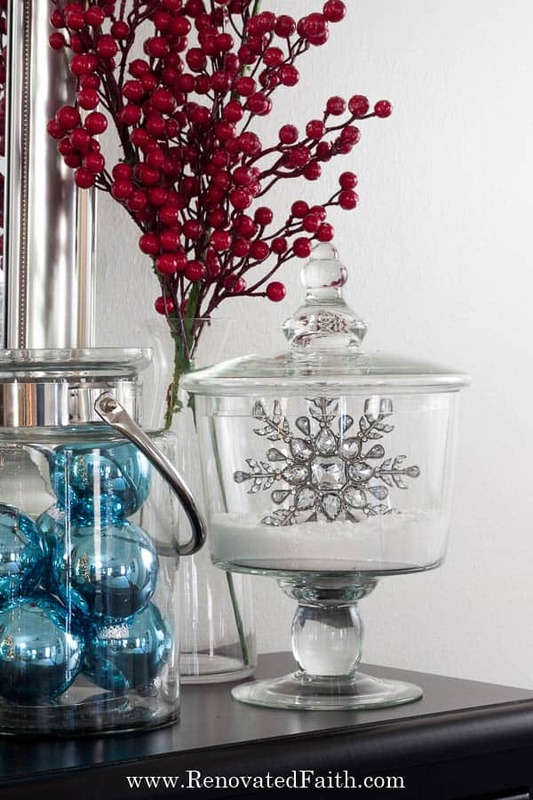 I love how the aqua blue ribbon looks with the snowflakes and silver and aqua Christmas ornaments. 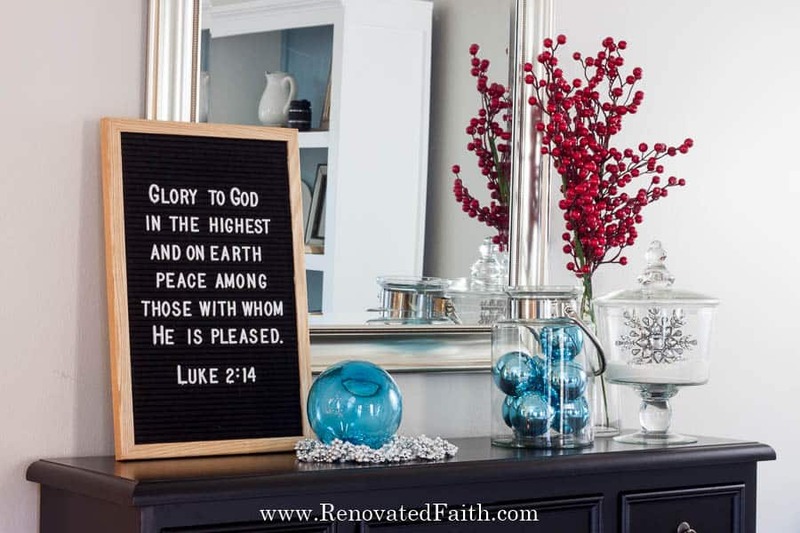 It gives the dining room a touch color and bling with elegant accents including my DIY Rustic Glam Christmas wreath you can see HERE. Driftwood and silver really compliment one another so I made wood slice place cards that also double as personalized wooden ornaments for my gifts. See how easy they are to make HERE. I also included some silver and teal Christmas ornaments in my advent wreath. 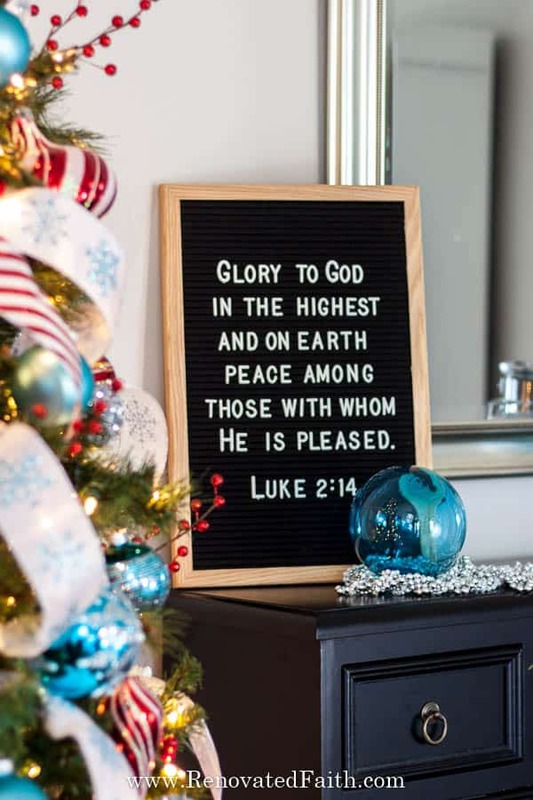 Last year was the first year I have had an advent wreath and it was fascinating and so meaningful to add into our décor and Christmas traditions. 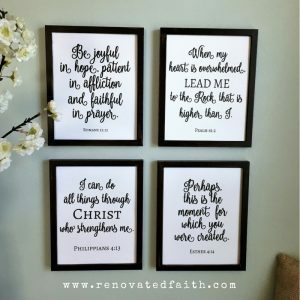 You can read more in my post Why Celebrate Advent? 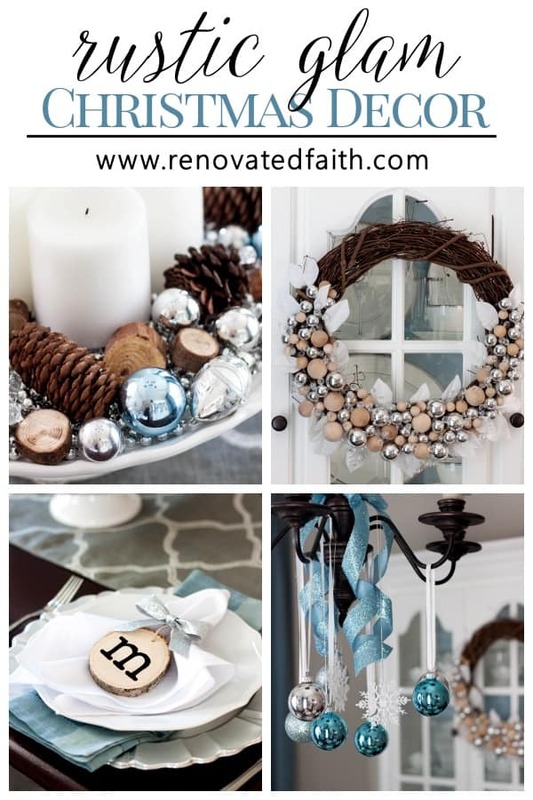 (Modern Advent Wreath Ideas). 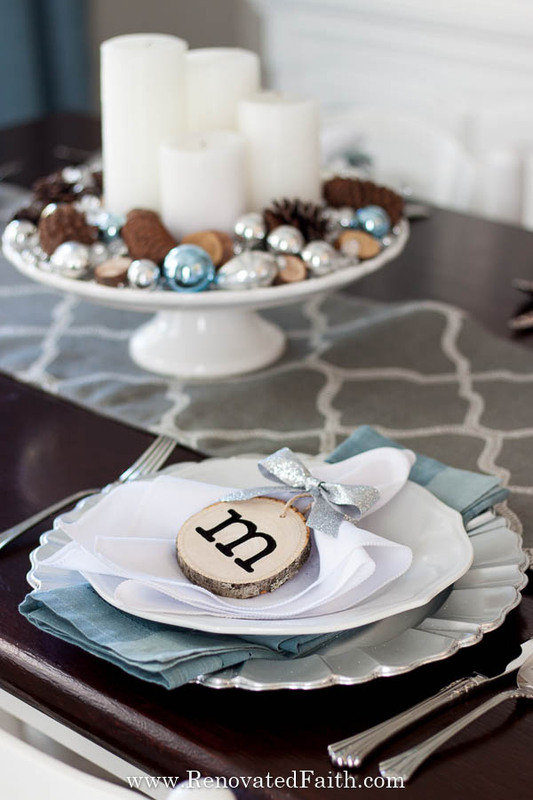 CLICK HERE for my post on Wood Slice Place Cards and my chandelier decor. Did you like this post? 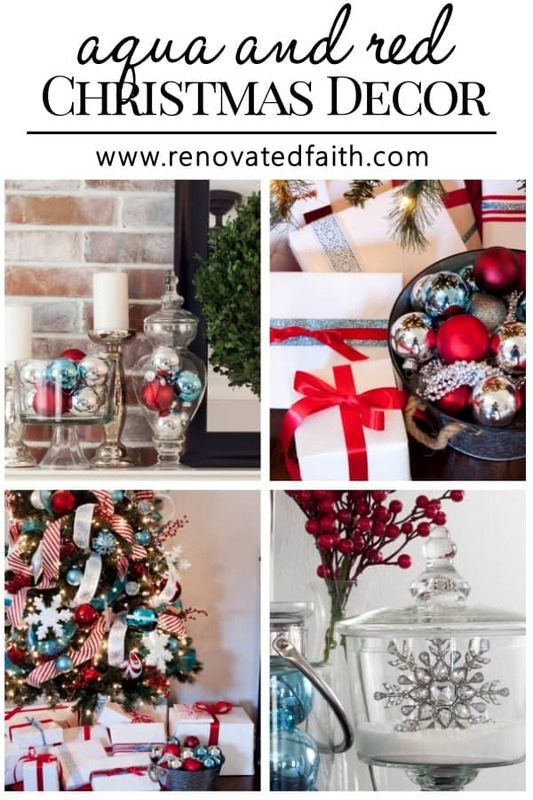 Be sure to share it and comment below to let me know what your favorite Christmas decor includes! Thank you so much Nancy. I appreciate that and thank you for taking the time to comment!